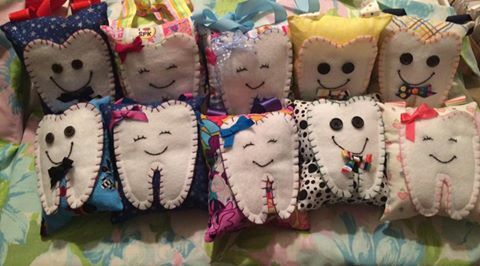 I finished all the little tooth fairy pillows I have been working on for my craft show. These started with a friend sending me a picture asking me if I could make one. Of course her picture was a bit different then what I ended up with but I think they are pretty darn cute! I sent a picture of them all together to my mom and she said "it's a whole mouthful!" which made me laugh. While I was making these I started naming them. I don't know why but they all just seemed like they needed a name. 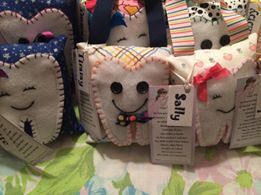 So they each come with a name and a cute tooth fairy poem I found on Pinterest. And look, they all fit into my son's giant shoe box! Although I think Timmy is sold if the gal comes to pick him up (she did!). Selling off my little children haha. If I don't sell them all (one can only hope) I'll put them up on my Etsy site. These are adorable Julie!! I need small people in my life!